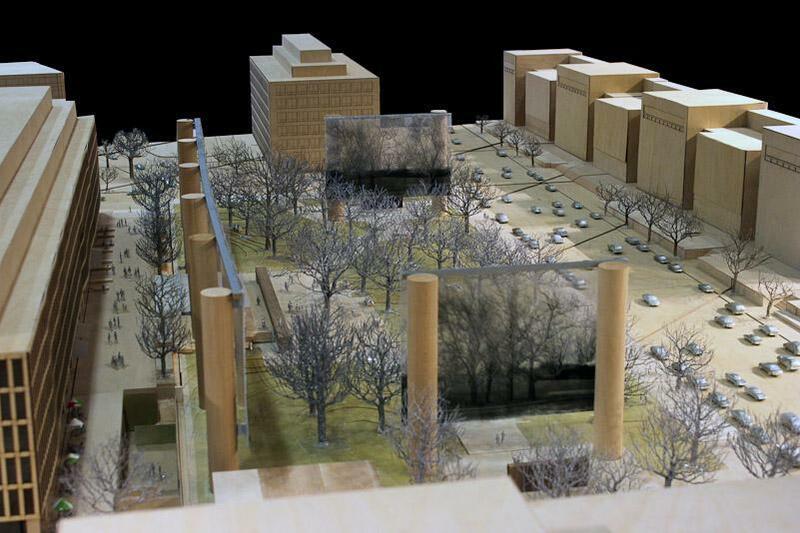 Model of Gehry’s plans for the Eisenhower Memorial. In 1999, two powerful senators, Ted Stevens and Daniel Inouye, both World War II veterans (Inouye was a Medal of Honor recipient), sponsored legislation to build a memorial in Washington, D.C., to Dwight Eisenhower, the Supreme Commander of the Allied Forces in Europe and two-term President of the United States. The memorial was scheduled for completion in 2007. It’s been pretty much downhill from there. In the intervening fifteen years, Stevens and Inouye’s noble idea has become a classic Washington boondoggle, an object lesson on how not to build a memorial in that city. The enabling legislation for the Eisenhower Memorial mandated a bipartisan commission composed of four senators, four representatives, and four citizens to be appointed by the president of the United States. I have served as an appointee for just over a year. The legislation does not limit the members’ terms, so, in theory, they serve until the memorial is finished or they resign. This is unfortunate, because, in this commission at least, new members would bring a much-needed infusion of fresh perspectives and thinking. Except for David Eisenhower, Ike’s grandson who in 2011 resigned over the memorial’s design (I’m his replacement), and Representative Mike Simpson of Idaho, the commissioners have zealously followed, with zero dissent, Rocco Siciliano, the man who serves as permanent chairman, and his loyal staff. A Rodeo Drive resident who was a junior member in the Eisenhower administration, Siciliano claims he can channel Ike. In a letter written shortly before his death, Senator Inouye expressed concern that the Eisenhower Memorial Commission (EMC) was ignoring the Eisenhower family’s doubts about the design. Siciliano was having none of it: “I am one person,” he wrote, “who feels competent to say that he believes President Eisenhower would be most pleased as to what the present Commissioners have unanimously accepted.” Shades of Shirley MacLaine! The EMC has a staff of nine full-time employees, several making six-figure salaries, ensconced in a K Street office suite. There’s also a senior advisor, a senior writer, and a crowd of consultants, including those for international affairs and communications, plus an assortment of advisory committees. Until its budget recently was cut in half by Congress, the staff was burning through $2 million of operating expenses a year. In 2010, more than a decade after its establishment, the EMC unanimously approved and acclaimed a $140 million design by Frank Gehry, the winner of a competition supervised by the General Services Administration’s Design Excellence Program. The Program called for a twenty-first century design, signaling that many architects working in a traditional vernacular need not apply. Because the GSA first solicited portfolios from architects for the memorial, the largest and most famous firms emerged at the top of the pile. The process disadvantaged small practices with talent but without high profiles. Of the forty-four proposals, only four made it to the short list. And, of course, the most glittering of all was Frank Gehry’s, perhaps the world’s most famous architect. Only after the shortlisted firms were chosen were they asked to submit a “design vision,” the most important element of the memorial. Hiring an architect before seeing his or her plan was rather like buying a pig in a poke. In fact, the design jury, composed of independent experts, said that all the designs were “mediocre” and that “none of the visions expressed the whole essence of Eisenhower.” The evaluation board, which included Siciliano and the EMC staff architect, ignored the jury’s sensible recommendation for another round of applications, and Gehry was awarded the commission in 2009. Critics have claimed that Siciliano stacked the deck for the architect. He has a long history and friendship with Gehry, dating back to the early 1980s when Siciliano was on the board of the Los Angeles Museum of Contemporary Art at the time it awarded Gehry one of his first important commissions. None of the EMC commissioners were chosen for their expertise on memorials, architecture, or aesthetics; they are either politicians or campaign donors. Even so, when they approved Gehry’s postmodern design, they must have realized that it was totally out of sync with the architecture of the National Mall. As Gehry has said, “There are sort of rules about architectural expression which have to fit into a certain channel. Screw that.” Eloquent indeed. Personal ties to Gehry aside, the EMC supported the design, I believe, because they feared being seen as philistines who clung to “old fashioned,” traditional architecture. A master salesman, Gehry preyed on their cultural insecurity. After all, they were told that he was a much sought-after modern “starchitect,” whose brilliant buildings were adored by the forward-looking elite worldwide. A vote for Gehry would establish their cultural hipness. Of course, they were not the first Gehry customers to fall for this line. What they unanimously approved was truly dumbfounding: a four-acre site (the Washington Monument and the Jefferson and Lincoln Memorials could occupy the space with room to spare) to be populated with ten pillars, each eight-stories high (Gehry slyly calls them “columns” to link them to the Mall’s classically inspired architecture). Between six of the pillars was to hang a gigantic stainless steel mesh “tapestry” (Gehry wrongly claims that tapestries are a traditional part of memorials) depicting a landscape of leafless trees allegedly portraying Kansas. Four other columns supporting smaller “tapestries” were to be placed at right angles to the major “tapestry,” thus forming a semi-enclosed space. Gehry called this an urban temple or a plaza, and this concept was the very heart of his plan and sales pitch. The pillars and columns were to dwarf a small figure of Ike as a teenager and two truly pedestrian, waxwork–like bas-reliefs that depict scenes from his military and presidential careers. These are the elements of the plan’s feeble core. There are many other flaws in Gehry’s design, but the most glaring is its failure to fulfill even the most basic function of a memorial. A memorial should be immediately understandable; it should elevate its subject, not diminish it; it should inspire awe and reverence, not create bewilderment; it should embody the character of its subject. Gehry’s self-important plan does just the opposite. Ike, the son of a hard-working Kansas family of modest means, was a humble, self-effacing soldier and president imbued with a sense of duty, honor, and patriotism. None of this is reflected in Gehry’s pompous harum-scarum design that is really about glorifying one of history’s most gargantuan architectural egos and not about memorializing Ike. What, it is fair to ask, will rising generations of Americans, who will have no memory of Ike, glean from Gehry’s plan? Will they be stirred and inspired by Ike’s deeds as soldier and president or impressed by his humble character? Will they come away feeling that here was greatness, as they do when they leave the Jefferson or Lincoln Memorials? Unlikely. It’s not surprising, therefore, that the EMC is spending over $2 million for a digital e-memorial, whatever that means, to explain Gehry’s design to visitors because that is something it can’t do for itself. Does it make sense for tourists to come to the site only to have their eyes immediately directed back to a digital device? The failure to raise money for Gehry’s plan for the Corcoran presaged what has happened with the Eisenhower Memorial. The design can’t command public support. Over $1 million have been spent on a private fundraising consultant, but fewer than $500,000 have been raised; fundraising efforts have netted a loss of approximately $700,000. A good part of this is because an avalanche of negative criticism in publications as diverse as The New Yorker (which said that the Eisenhower Memorial was a bipartisan issue: everyone hates it) and National Review, as well as reasoned opposition from many quarters, including the Eisenhower family, has made donors wary of contributing. Because of the lack of private funds, the taxpayers have been footing the bill. A recent congressional report (see below), finds that, to date, the EMC has spent around $44 million of the nearly $65 million initially appropriated by Congress. Gehry’s firm has already collected over $16 million dollars and $13 million more have gone for administrative support and for managing the design process. Astonishingly, the EMC paid the Gehry team for 95 percent of the construction documents, even before the plan received the first federal approval, a process that usually involves many design changes over a considerable period of time. Congressional criticism of the EMC has recently risen to a new level. In July 2014, the House Committee on Appropriations called for an “open, public, and transparent redesign process” and mandated the EMC “cease all expenditures relating to the current memorial design” until that process was in place. And a bill (H.R.5203), co-sponsored by Chairman Ken Calvert of the House Subcommittee on Appropriations for Interior, Environment, and Related Agencies, and Congressman Rob Bishop of the House Committee on Natural Resources, seeks to defund the Commission and its staff. Moreover, a waiver from the Federal Commemorative Works Act, which would have allowed construction to begin before all the money for the memorial was secured, has been removed. Because of the poor record of private support, this means millions more of federal dollars will have to be in place before the first shovel of earth can be turned—a daunting prospect. In 2014, the EMC asked Congress for $51 million and received just $1 million for operating expenses to keep the lights on. Heedless of this heavy flak and completely tone deaf to mounting criticism, the EMC, driven by its staff and chairman, steadily plods on. In April 2014, a full decade-and-a-half after it was established, the EMC finally presented the Gehry design for approval to the National Capital Planning Commission (NCPC), which is supposed to ensure that proposed structures in the District conform to established guidelines. Much to the EMC’s dismay, the Gehry plan was turned down for a number of reasons, but principally because some of the pillars supporting the “tapestries” blocked the view toward the Capitol. In September, the EMC met and voted to return to the NCPC with a rejiggered Gehry design. Two senators, Jack Reed of Rhode Island (who said it was a “good time to give someone else a chance and bring in new perspectives”) and Jerry Moran of Kansas, resigned within two weeks of the meeting. The revised design removed the side “tapestries,” but left intact two of the pillars that had previously supported them. These forlorn, functionless objects now look like huge industrial smokestacks; one NCPC member said they resembled supports for a highway overpass; another likened the pillars to the ruins in the last scene of Planet of the Apes. Nonetheless, despite further harsh criticism from some NCPC commissioners, and a single brave vote against acceptance cast by Commissioner Beth White, the revised Gehry design was given preliminary approval, a stunning example of bureaucratic nearsightedness. There are two issues at play here: the NCPC’s spinelessness and Gehry’s frantic zeal to get his Eisenhower Memorial built in the nation’s capital. So desperate was Gehry that he sacrificed his elaborate plan for a temple or plaza, the design’s raison d’être, simply to meet the narrow technical guidelines of the NCPC. So much for artistic integrity. Moreover, by approving the Gehry design merely because it allegedly satisfied its technical guidelines, the NCPC ignored the larger issue: the clash of Gehry’s Eisenhower Memorial plan with the National Mall. This bad precedent will encourage further actions of this sort where expedience trumps good architecture and good sense. Energized, the EMC sped on to the U.S. Commission of Fine Arts (CFA), an agency charged with reviewing the design and aesthetic merits of projects to be built in Washington. The Gehry design had already received preliminary approval from the CFA, but not without harsh criticism from some of the commissioners, one even claiming that Gehry’s plan would fail as “a traditional first-semester architecture exercise.” Distressingly, Earl A. Powell III, the long-time director of the National Gallery and Chairman of the CFA, was Gehry’s cheerleader. With Powell’s continuing support, the revised Gehry design sailed though the CFA at its October meeting. Now the EMC is doing a premature victory dance as they rush to get final approvals from the NCPC and CFA. They’ve even declared in a recent press release that they intend to break ground in 2015, making one wonder if the EMC and its aggressive staff have lost touch with reality. To begin construction, the EMC needs north of $80 million in additional funds, but Gehry is notorious for his massive cost overruns, so the final price tag will probably be much higher. As John Silber wrote in Architecture of the Absurd, “When Gehry is hired, the partnership of client and architect is virtual except when it comes to paying the bill.” These overruns have to be paid by Gehry’s clients, but in the case of the Eisenhower Memorial, the EMC commissioners need not open their wallets because the American taxpayers will have to foot that bill. Given the massive public opposition to the memorial, including that of the Eisenhower family, and the lack of appropriations from Congress, it is far-fetched to believe that Gehry’s plan will ever be fully funded. Yet, as long as the EMC continues to get a modicum of operating expenses and remains under Gehry’s thrall, it will survive, proving President Reagan’s maxim that a “government bureau is the nearest thing to eternal life.” If the EMC is not stopped, it will spend down its remaining money, about $25 million, chasing Gehry’s bill of goods. And, when it’s spent its last cent, there will be no Eisenhower Memorial or the resolve to start again. If this happens, a great American will be fittingly honored and the National Mall will escape disfigurement by Frank Gehry.